Believe it or not, Halloween is just around the corner! To get my kids excited and seize the opportunity to get outside and enjoy some beautiful Fall weather, we decided to try a little experiment. It all started with a simple enough question: “How many squares of toilet paper do you think it would take to wrap you up like a mummy?” Challenge accepted. Learn how we turned this fun and silly activity into an afternoon full of Halloween estimation and measurement! 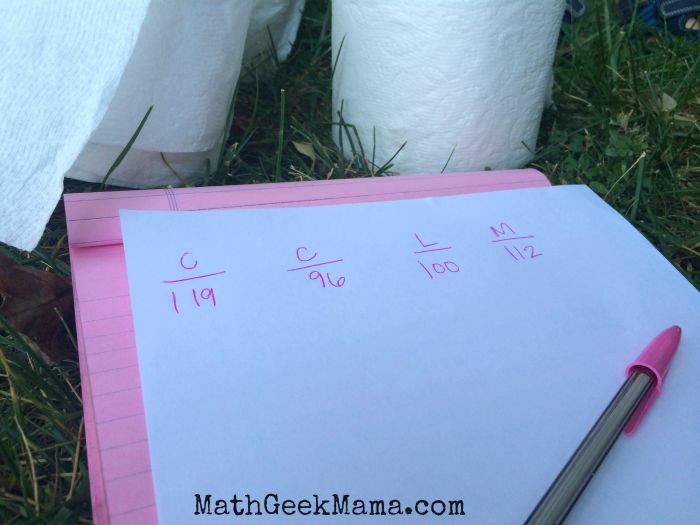 To prepare, we grabbed a handful of toilet paper rolls and some rulers, and headed outside. 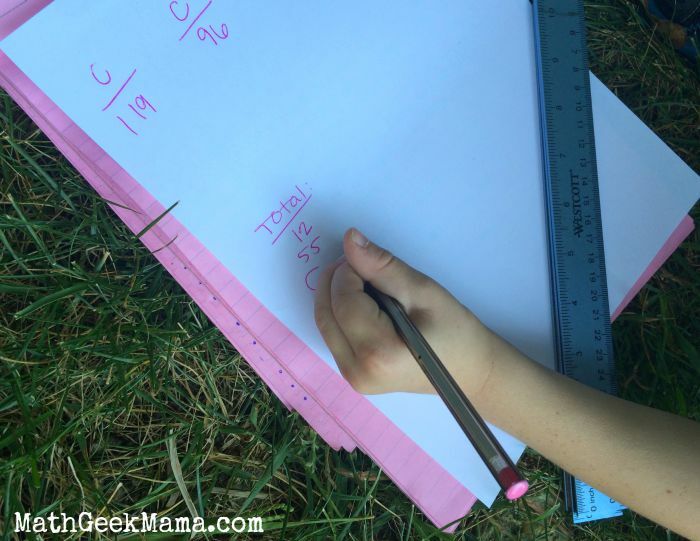 I wanted to help my kids start thinking about educated guesses, and ways we can try to logically estimate, rather than just throwing random numbers out there. Admittedly, this was a challenge for my kids (ages 4, 5 and 6), but I don’t think it’s ever too early to start! 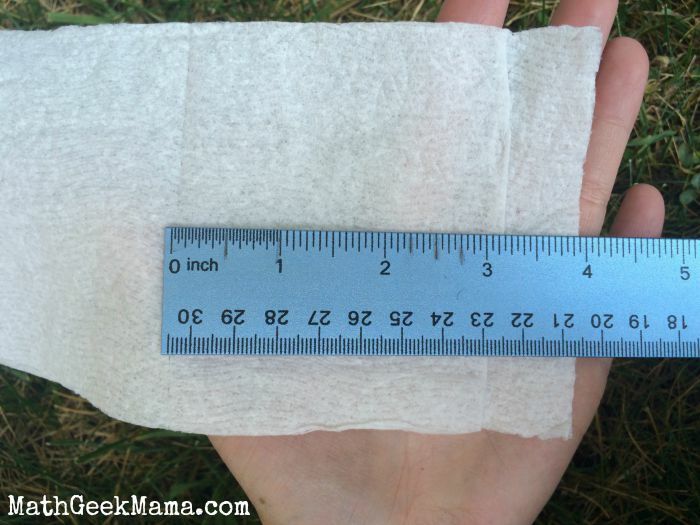 To begin, we measured one square of toilet paper, which was approximately four inches long. We then decided to start by wrapping just my daughter’s arm to try and get an idea for the rest of her. 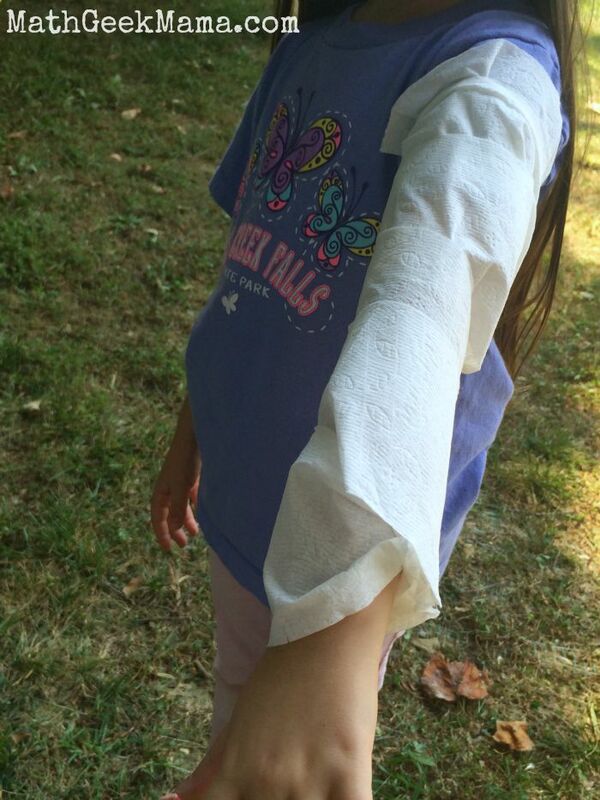 After measuring her arm as well, my daughter estimated 12 squares of toilet paper to cover her arm. We took that to estimate what it would take to wrap up the rest of her. She’s not able to count by 12’s, so we used 10 and counted by tens to try and estimate a total. She counted to 100, and so we all guessed a number around 100 for the total number of squares. Then it was time to finish wrapping her up like a mummy! I will be honest, it was not easy to wrap effectively and count at the same time. So our final answer may not have been perfectly exact, but it was great fun! And a fantastic opportunity for my younger ones to practice counting! My youngest daughter helped me wrap and count while my son kept track of the numbers. Each time we did a section, we would tear it off and start another. When we were done, we added up all the numbers, and the grand total? 126 squares! My daughter was surprised, because this was actually not even one whole roll of toilet paper. Her original guess, before we started to measure and think about estimation techniques was that it would take 5 rolls to wrap her up head to toe. After we finished, we had some discussion about how we estimated, as well as how our total would change if we had wrapped the toilet paper tighter or closer together. “Well, how do you know?” I asked. “Because they’re smaller!” True that. 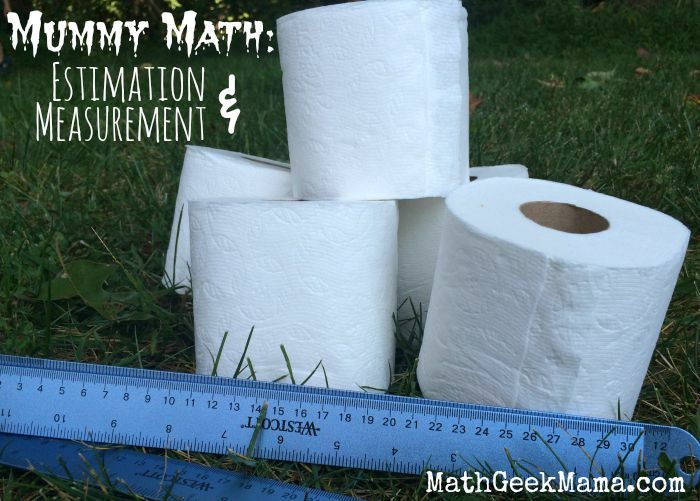 If you have older ones, there are lots of ways you can explore this further, such as making more precise estimations based on the length of each square, or figuring out the total length of toilet paper after you find the total. (In our case, it would be about 504 inches long, or 42 feet). 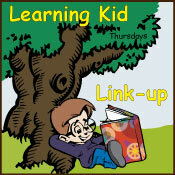 What are some other ways you could extend the learning in this simple activity? 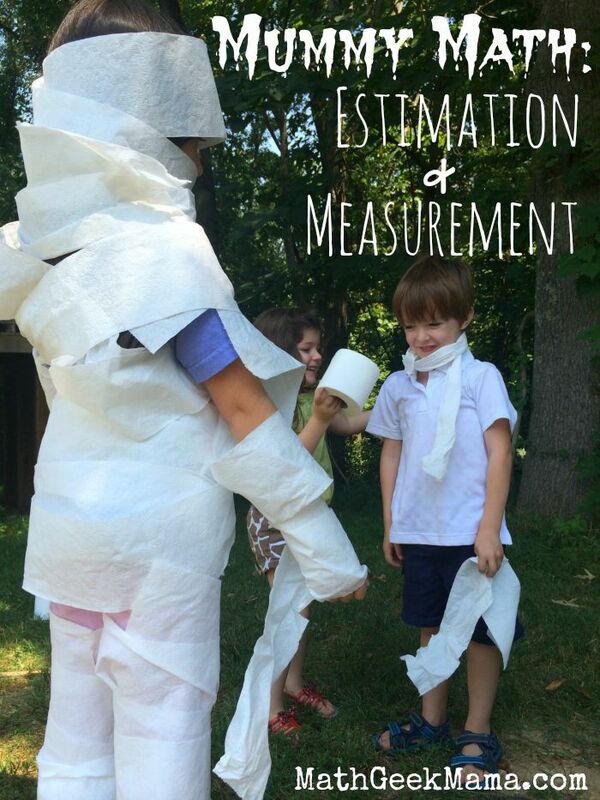 Do you have any fun ideas for Halloween estimation and measurement activities? 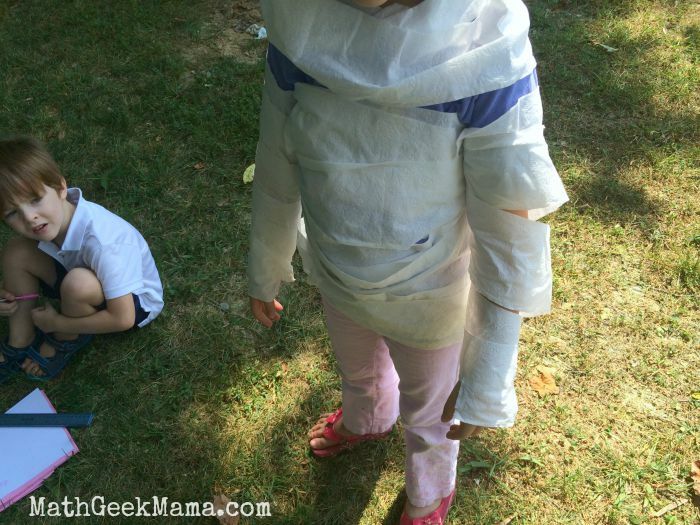 We wrapped us up like mummy’s last halloween and absolutely loved it. Good idea to use estimation for it to teach math in a fun way. What a fun idea! Pinning for the future. What a fun experiment! I love how you turned a great activity into a learning experience! 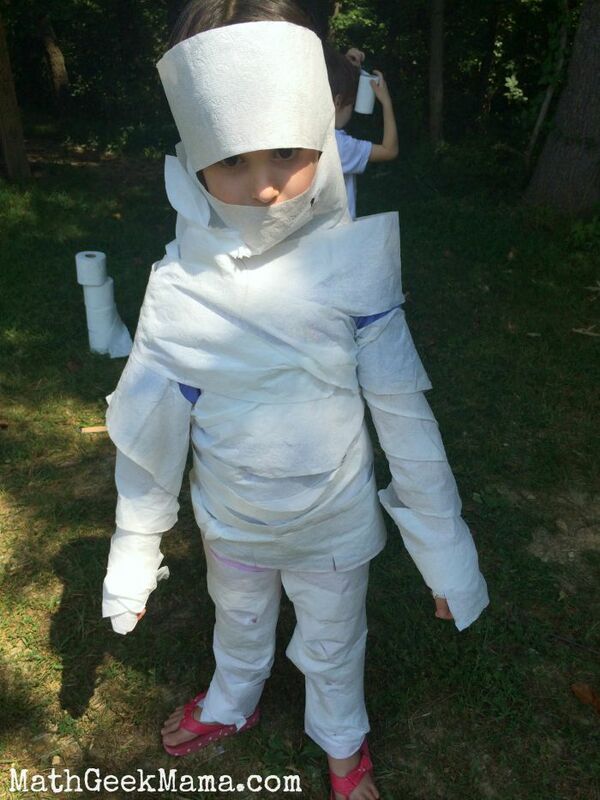 Last year when we studied Egypt I gave my kids five rolls of toilet paper and ended up with three cute little mummies. We had so much fun!!! We laughed and laughed! You wouldn’t imagine the clean up though. Toilet paper was on top of bookcases and between armchairs, behind tables and on top of toys… It was insanity! I love your educational spin on it! We didn’t measure toilet paper, but we just recently started practicing “educated guesses” with paper airplanes. This is so perfect! We are learning about Egypt in a couple weeks. We can do this excercise when we learn about mummies. The people who actually wrapped mummies must have had to estimate. Great idea! Oh you’re so right Gale! Great point! This looks like SO much fun! My girls are still pretty young, but I bet we could do a simple version of it and they would have a blast. We don’t really do Halloween – I’m not sure they even know what mummies are. But wrapping themselves up in toilet paper would be hilarious to them. And unrolling the TP is my baby’s absolute favorite thing in the world to do (grrr….) so I’m sure she’d help! Thanks for posting! Haha, yes unrolling it is a favorite activity of my little one too! But my kids thought this was seriously the best thing ever! 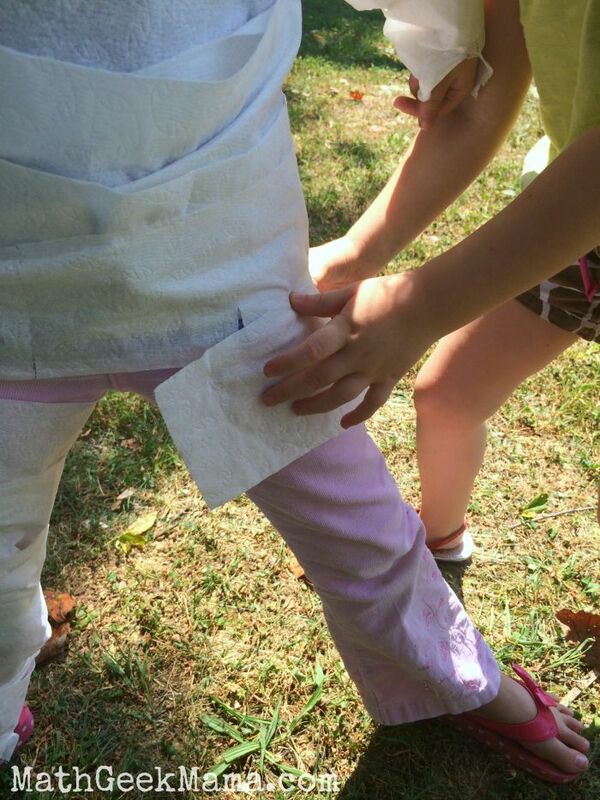 I mean, who wouldn’t like to wrap up their brother or sister in TP?! 🙂 Hope your girls have fun!